Corporate Reporting Research 2015. - nexxar lab. - nexxar lab. This year's research is focused on how accessibility issues are addressed in digital corporate reports. Each year we conduct an extensive research, to gain insights on the actual status of digital corporate reporting. As in the 2014 research, we looked at both the annual and corporate responsibility reports of the 150 biggest European companies in terms of turnover (source: CNN Money / Fortune 500) on the one hand, and market value (source: FT Europe 500) on the other hand. The combination of both groups results in a total of 188 companies analysed this summer. Following the assumption that companies want to make corporate information available for the biggest audience possible within their target group, we put the topic of accessibility in the centre of this year’s analysis and selected a few best practice examples below. Among the companies that provided their report in some kind of HTML version, 64% of the reports were designed responsive, thus making the report available for different screen sizes and devices. Interesting fact: We experienced that one of the 188 reports was password-protected, with the company stating that the information provided was for banks and bondholders only. Looking at the corporate responsibility reports, we learn that 50% of the companies have a PDF report and 34% provide some kind of HTML report version. The remaining 16% do either not report on corporate responsibility issues, or have their reporting integrated into their annual report PDF. In terms of responsive design, again the majority of the companies that report in HTML, 62% to be exact, chose this option to enhance the accessibility of their corporate responsibility report. Summing up, we experience a lot of different approaches when it comes to reporting format – and it is indeed a tough decision, especially in light of cost/benefit considerations. One that every company needs to take for themselves. Starting with the target group, companies must ask themselves who they are reporting for in the first place and what impression they want to evoke among their users. Moving forward, it’s not the question of design that should matter the most, but the question of “how accessible?” the report shall be. Depending on the answer to this question, there are different roads to go down – from a neatly designed PDF available for download on the corporate website, to a complete cross-media reporting concept. Whatever the circumstances and the chosen path, a good reporting concept will always seize the opportunity to transport the corporate information in the best possible way in order to increase (Google) findability and user rates. Getting back to our research, we chose a few best practice examples that illustrate creative ideas to make report information more easily accessible. 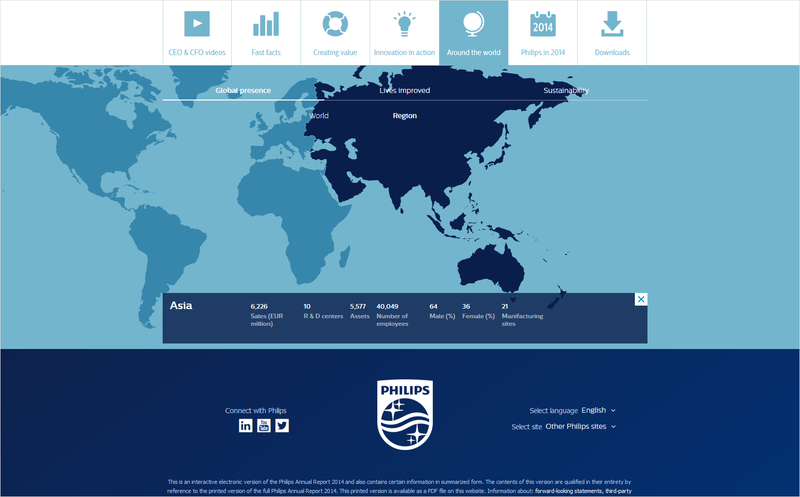 Interactive at-a-glance information in the Philips Annual Report 2014: A tab solution offers users various possibilities to discover the highlights of Philips’ financial year, including CFO and CEO videos, clickable infographics as well as highlighted fast facts linking to chapters inside the report. 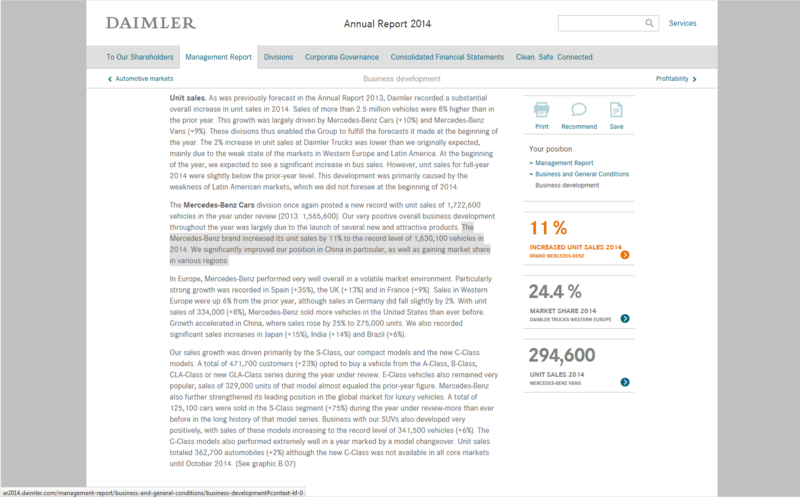 The Daimler Annual Report 2014 presents a great and user-friendly way to disclose highlights of the business year: at click on one of the interactive key figures in the right panel, the user jumps to the related text passage which is additionally highlighted in grey. 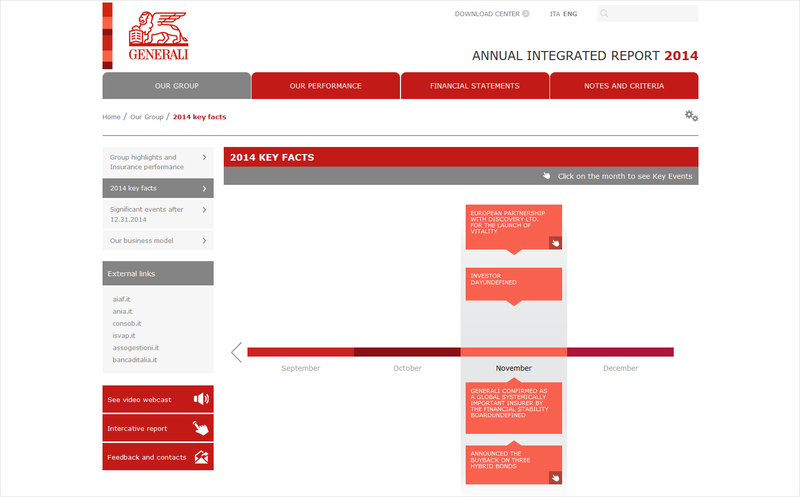 Enhanced navigation through interactive timeline in the Generali Annual Integrated Report 2014: on click on one of the presented key facts, the focus jumps to the related content on the page. 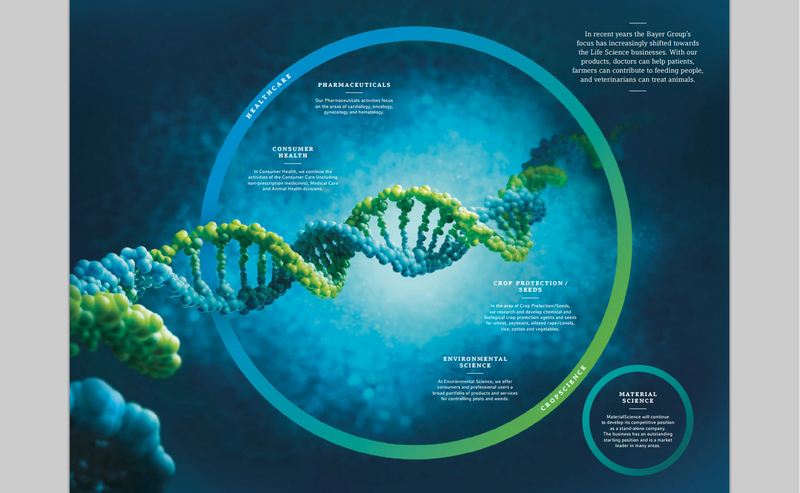 Although the Bayer Integrated Annual Report PDF does not make use of bookmarks, quite a few steps have been taken to improve the accessibility on screen: most of the report content is displayed in one column, making up & down scrolling unnecessary. Double-page tables and images are merged and therefore displayed correctly at a glance, graphical information is implemented in vector format to maintain the sharpness of the graph when zooming in. 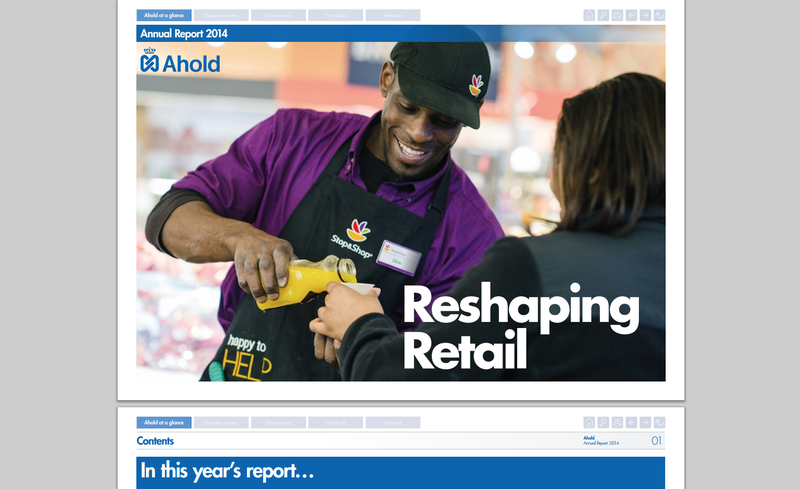 The interactive version of the Ahold Annual Report PDF is truly optimised for the use on screen: enough space for big tables thanks to landscape formatting, easy orientation through bookmarks and additional top navigation, fast access to information via linked notes references in the financial tables. Our 2015 corporate reporting research shows the full variety of approaches to reporting. Some clearly explore the possibilities of the web communication channel better than others. In future, especially web PDFs must focus on increasing their accessibility or at least visual appearance on screen.